Successfully Added Top Value HDD Media Player Enclosure to your Shopping Cart. Incredibly priced multimedia player HDD Enclosure for massive portable storage and playback of your music, videos, and photos direct on a TV. By installing a 2.5 inch IDE hard disk drive of up to 160GB, you will be getting massive amounts of storage space for all your digital files. It will easily play MPEG1/2/4 files including DIVX and XVID, has AV VGA OUT for connecting to many various monitors as well as COAXIAL OUT for connecting to high end speaker systems. This is truly a great value HDD player, is easy to set up and use, and is available direct from Chinavasion Wholesale. Works with popular video formats including - MPEG 1/2/4, AVI, DIVX, XVID, MPG, DAT, VOB. Hard disk drive (HDD) NOT included. The HDD you choose to install must be formatted correctly for the enclosure to be able to operate. 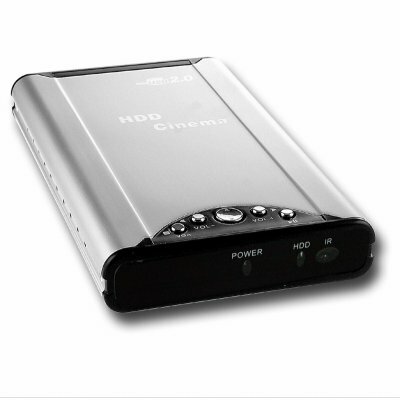 I already had two dvd/divx players at home but the HDD cinema HG-2010 shows movies with a better quality than the other two. The subtitles are fine (you have sometimes to choose then first) and the music player has a lyric file decoder.